While there are thousands of board and card games that work well with two players, there’s often something a little bit special about games that specifically designed for two players to go head to head. Below you’ll find my favourites, with a skew towards games for all: I’d be confident of teaching all but two these to pretty much anyone. Better still, almost all of them should cost you less than about £20. Games are linked by the title where I’ve reviewed them elsewhere on the site – and pretty much all of them are easily found in stores and online. And, as always, if you have any questions or want more info – or have your own recommendations – just pop them in the ‘comments’ below. Battle Line, from the master of abstract game design Reina Knizia, is a fantastic card game that’s been in print for almost 20 years. Essentially an area control game, the idea is to win either five of the nine areas – or three adjacent areas (picture nine flags across the centre of the table between the two players, with you each playing cards to your side of those flags). 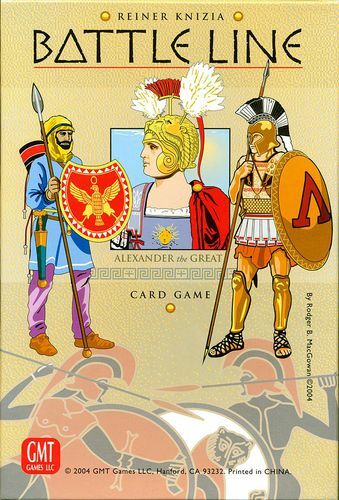 Players take it in turns to play and then draw a card: either a numbered card (1-10 in six colours), or tactics card (they add complexity, but you can leave them out). To win a flag you need to have a three-card combo in front of it that beats your opponent – decided by a simple poker-style scoring system (runs, straights and flushes). You can even claim a flag early if you can prove – due to what has been played elsewhere – that your opponent can’t possibly beat it. This is a travel version of the popular board game Blokus from Mattel, with a smaller board and starting positions designed specifically for two players. 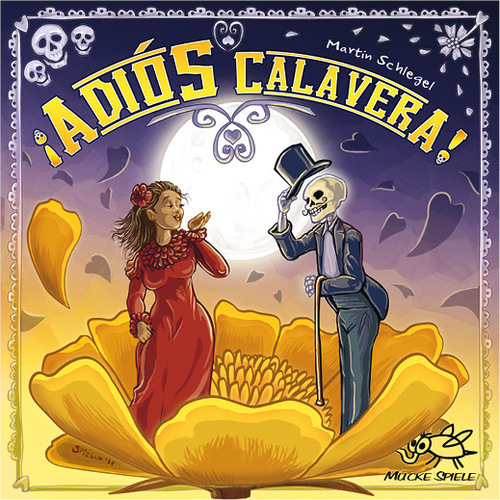 It has many of the classic two-player abstract tropes: each player has an identical set of pieces, taking it in turns to place one, making it a totally even playing field – and you start with all pieces available, so there are no elements of luck involved. The game’s rules are simple enough for a six-year-old to grasp, but there’s plenty of tactical depth there for seasoned gamers too. See also: Hive (a hugely popular Chess-like abstract game) and Little Big Fish (a draughts-style game with added bells and whistles, including a modular board and some board spaces that set off random effects). I’ve deliberately steered clear of war games on this list, as they’re an entire genre to themselves – but no game has done more to straddle the divide between war and board games than Twilight Struggle. The number one game on Board Game Geek for several years (and still number four at the time of writing), the game emulates the battle for political influence across the globe between the USA and the USSR during the Cold War. It’s a card-driven game, with each card depicting an actual historic event – and each allowing players to manipulate the influence its superpower has over a country or countries. It’s a truly epic experience, and takes some plays to get your head around, but is well worth the effort. See also: Wir Sind das Volk! (a similar style game set in the aftermath of World War II, with East and West Germany in a battle to make its citizens the happiest). The second Reina Knizia abstract on the list, Lost Cities shares several traits with Battle Line above: players face off on opposite sides placing cards either side of (this time five) central areas. This time there are five colours with numbers 1-10 in each, plus several extra cards in each colour that can multiply your score in it. The trick is you must play these multipliers before you play any number cards of the colour (so it’s often a gamble) – and you can only ever play a higher number of a colour than you’ve already played. You won’t score positively in a colour unless your cards add up to at least 20 – and negatives also multiply. You have a play a card every round – either discarded or to your area – and both players tend to end up feeling the game has got something against them. It’s very clever indeed, but incredibly simple in terms of rules. While a bit more of a gamer’s game, Caverna: Cave vs Cave does a great job of simplifying and distilling designer Uwe Rosenberg’s classic euro game Caverna into a small box experience. Players collect resources (six types) by taking actions, with the aim of using them to furnish their caves with new rooms – that will in turn either score them points or make their gathering and other actions more efficient. Despite a relatively small amount of components there’s plenty of variety and denial can be an important part of play, so it isn’t just a ‘do your own thing’ game. See also: Rosenberg has given the same treatment to two of his other euro games. Agricola: All Creatures Big and Small is the most popular, distilling Agricola down to animal collection; but Le Havre: Inland Port is a clever but ultimately uninspiring resource management game owing little to its predecessor. This clever and quick little card game has just 28 cards and 15 cardboard tokens – but packs a lot of game into a very small package. Much as in Lost Cities above, both players will find themselves making agonising decisions – but here it feels as if every one, even the first, is like this each round. On each round you’ll both play the exact same four actions, but the order in which you do them and how they affect the cards in play is always changing. Again you’re trying to win control in the majority of seven areas in which you can play cards, but some hidden information spices things up – along with the fact you know all but one card is placed in every round (but you won’t know the missing card). A game can be over in as little as five minutes, a single round, but it always feels like you’ve strained your brain in the process. While a little longer and slightly more complex than most games on this list, I still feel confident I could teach Targi to most non-gamers. It involves laying cards in a 5×5 grid before players take it in turns to claim a column or row (until they’ve claimed three different ones each). You place your three pieces on edge cards, but also claim the two central spots where your rows/column intersect (for a possible five spaces each). These cards then give you resources, or let you spend resources to buy cards that then go in front of you and give you either an ongoing or immediate bonus – as well as end game points. It clever combines set collection, worker placement and tableau building while adding that crucial competitive two-player edge to create a really great game. I started playing this one on Yucata back in 2011 and got my own copy in 2013; and it has been in my Top 50 games since I started writing one in 2014 – not bad for a 25 year-old abstract game. Played on a 9×9 grid, players take it in turns to either play or draw a card – placing a stone in their colour on the board if they play a card. Each player has a maximum of five cards, but they’re left face up on the table at all times – so while the draw is random, all information is open. Each card allows you to move a specific number of spaces (1-3) in a specific direction, but you can’t land on your own pieces – and only have four times may you land on your opponents piece, flipping it to our colour. Points are gained for large connected areas of your colour and despite its simplicity it plays out in a really unique way. I seem to have been talking about this game a lot since its release, with little to no success in raising its profile, but hey – I think there’s a little life in this flogged horse yet! What is, in essence, a simple rush across a 9×9 grid for your eight playing pieces is made unique by one of your going north-south and the other east-west. The amount a piece can move is dictated by how many pieces there are in its row – but of course, one player’s tow is the other’s column – so you need to think about the strength of movement you’re giving your opponent as well as yourself. Add in eight different special powers for the pieces, and several variants of how many to use them, and you also have huge replayability. It also looks great – so what are you waiting for?! It was a close thing between my top three, and to be honest I think they’re all about even in terms of quality; but it is the proven crossover appeal of Patchwork that has put it to the top of my list. 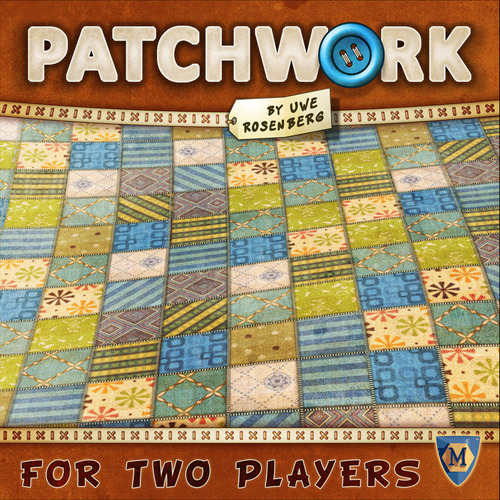 Just outside the Top 50 on Board Game Geek, it has been a massive hit with gamers – but the gorgeous patchwork artwork on the cardboard pieces makes it a real head turner – and a game that’s very easy to get non-gamers to take a look at; especially spouses. 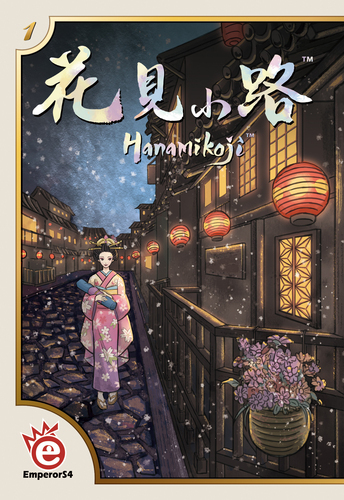 Unfortunately, outside mainline Europe, board gaming is still seen as nerdy and blokey in many places – so it is always great to see a game taking a punt on an unusual and female dominated theme and making it work. Better still, it’s a brilliantly mean spatial puzzle of a game with a small rules overhead but loads of depth. There are a couple of two-player games that used to be firm favourites, but have since left my collection. 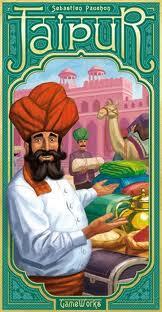 Jaipur is a fun little game I’d happily recommend to new gamers, and that is hugely popular – but personally I got a little tired of it over time, as it seemed the game came down to luck in more plays than I was happy with. It was similar with Jambo, which was enjoyable until being blown out of the water for me when Targi came along. I also feel I’ll get told off by someone if I don’t at least mention 7 Wonders Duel: a massive hit that is in the Top 10 games of all time on Board Game Geek at the time of writing. The scoring mechanisms have a strong resemblance to its sister game 7 Wonders, as you use cards to claim other cards as you strive for end game points – but the mechanism of the game underwhelmed me and it felt as if a lot of games ended up being a little ‘on rails’, out of your control. But other opinions are obviously available – it has been a huge and popular seller.